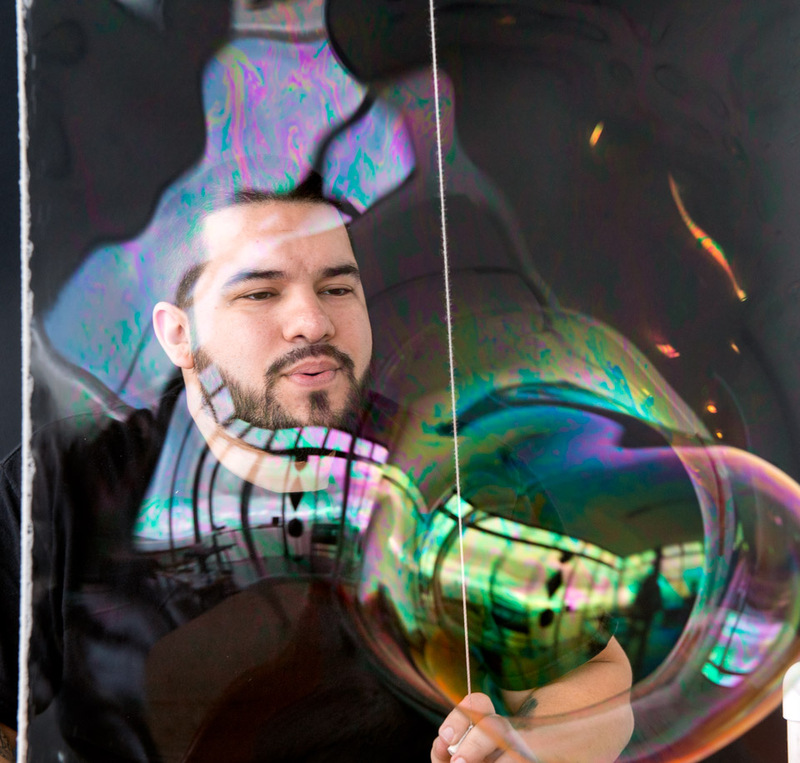 A soap film becomes an ever-changing work of art. Under the influence of gravity, a thin soap film constantly changes thickness, creating an ever-shifting array of colors. Note: This frame is made with 1/2-inch PVC pipe, Schedule 40. To cut the lengths called for here, you will need a total of 18–20 feet (5.5–6 meters). For other sizes of pipe, you'll need to adjust the measurements below accordingly. Bubble solution made from 2/3 cup (150 mL) Dawn™ dishwashing liquid, plus 1 tablespoon glycerin (available in drugstores) mixed into one gallon (3.8 L) of water. Note: If you have trouble making good soap films, try using distilled water instead of tap water. Aging the solution overnight before use significantly increases the lifetime of the soap films (and bubbles). Assemble the frame as shown in the illustration below (click to enlarge). Attach the string and pull handle as indicated. When you’re done, fill the plastic tray with bubble solution until the entire lower half of the crossbar is submerged. 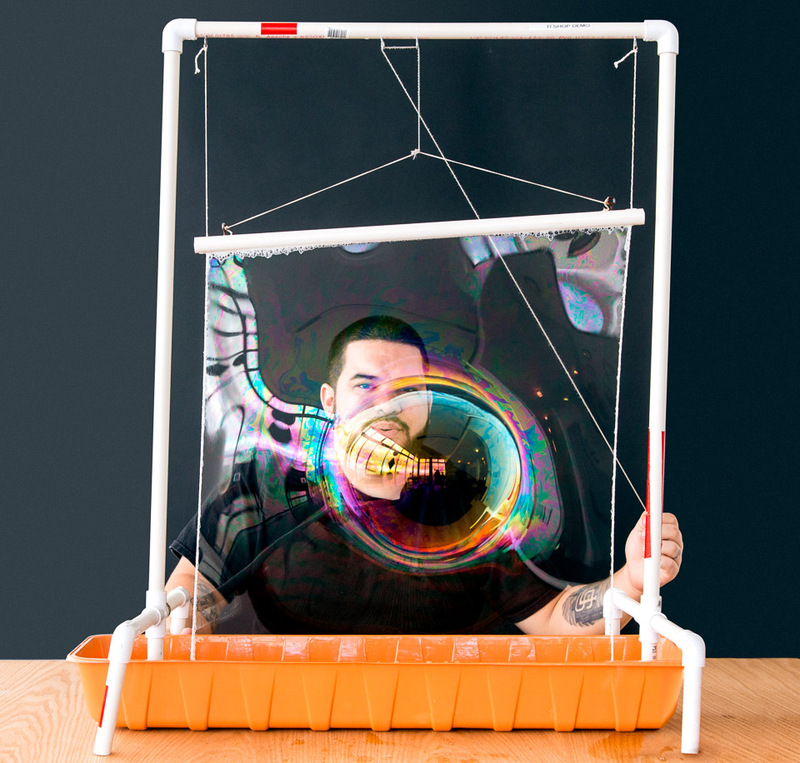 This activity works best with two people: one to pull the string to make the soap film and the other to explore its behavior. Using the solution in the tray, thoroughly wet the strings and any other surfaces that will come into contact with the soap film (so the film doesn’t immediately pop). Carefully pull the handle and string to raise the bar out of the soapy water and make a soap film. Notice the changing colors reflected by the film. Note that the colored patterns are most easily seen if you stand with your back to a white surface and view the soap film against a black background. Gently shake the frame back and forth and notice the pattern of waves on the film. 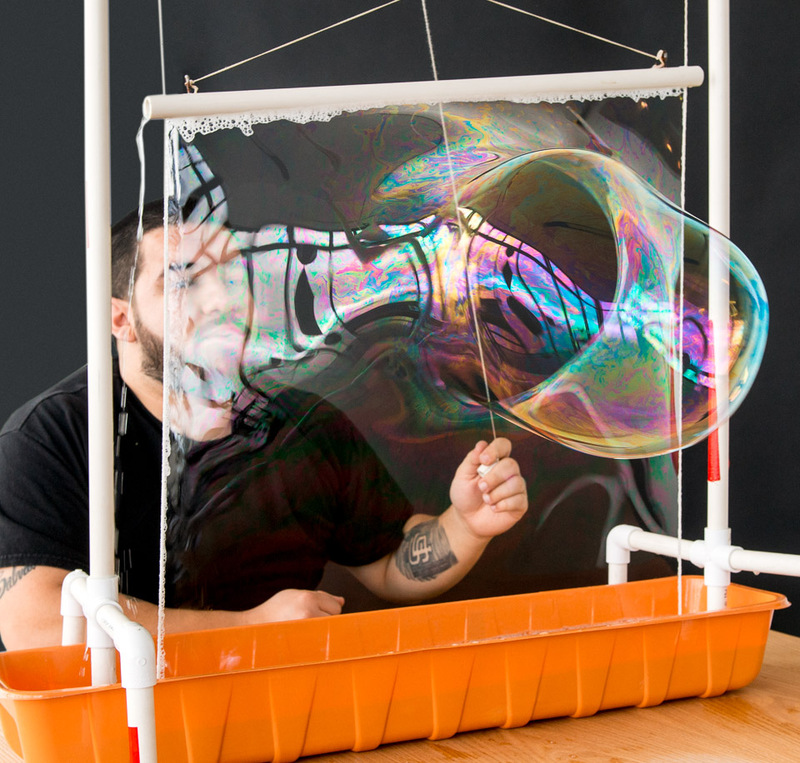 Stand a few feet away and blow gently onto the soap film. Notice that it stretches out into a bulge when you blow and returns to its original flat shape when you stop. Put a dry finger through the soap film and the film will pop. Coat your finger with the bubble solution and try again. This time, you should be able to push your finger into the soap film without the film popping. Try coating other objects in bubble solution: Does the tip of a sharpened pencil work? A knitting needle? The bottom of a paper cup? Can you pass an object through the film to a friend on the other side? Now try coating a small piece of PVC pipe entirely in bubble solution. Can you push one end through the film and pop the bubble inside (if one forms) to make a “channel” in the soap film? Can you pass a dry object through this channel without popping the soap film? A soap film is a soapy-water sandwich, with two outside layers of soap molecules forming boundaries around a layer of soapy water. The thickness of the soap film changes as the water drains down the inside of the film. When light strikes the front surface of the soap film, some of the light is reflected (about 4 percent). The remainder of the wave is transmitted through to the rear surface. At the rear surface of the soap film, more of the light is reflected back to your eyes. The light reflecting from the front of the film meets up with the light reflecting from the back of the film, and the waves combine. The beautiful colors you see on the soap film are due to interference patterns, created when light reflects off the two surfaces of the thin soap film. Interference patterns are created when two reflected waves line up in phase or out of phase. If two waves line up in phase, with crests together and troughs together, we say that the waves are interfering constructively. When two waves line up out of phase, crest to trough, we say that the waves are interfering destructively. Therefore, everywhere you see yellow, the film is just the right thickness to destructively interfere with the blue light waves, removing them. Where you see cyan, the red light has been removed. And where you see magenta, the green light has been removed. The surface tension that allows a soap film to form is caused by the tendency of water to minimize its surface area. Soap reduces surface tension by separating water molecules from each other. When a finger, pencil, or piece of PVC pipe is coated with bubble solution and inserted into the soap film, the film stays in contact with a like solution and remains continuous. A dry finger, however, interrupts that continuity, making it impossible to maintain surface tension, so the bubble bursts. Exploring the properties of soap films can help explain the properties of plasma membranes and the mechanics of transport across membranes. Cells need to import some materials, such as oxygen and nutrients, and export others, such as waste. At the boundary of every cell is a plasma membrane that regulates what goes into and out of the cell. Plasma membranes are similar to soap films in several ways. Both are flexible, bilayered structures formed by molecules with hydrophilic (water-attracting) and hydrophobic (water-repelling) ends. While plasma membranes don’t “pop” when confronted by unlike substances, both plasma membranes and soap films are selectively permeable, allowing certain substances to move through them. In some cases, proteins even provide channels or tunnels for the passage of molecules or ions, just as you could pass an object through the short length of soap-coated PVC pipe. And moving the PVC pipe around in the soap film can model the way proteins move around within plasma membranes. To explore this further, check out the related Snack, Cellular Soap Opera.